Remember the classic Connect 4 game that you used to play as a kid? Here it is in giant scale! 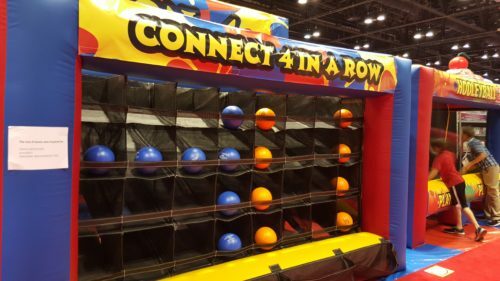 This unit uses 2 different sets of colored balls to create a Connect 4 challenge that will drive you crazy but keep you laughing. You really have to practice to hit the right spot to achieve that Connect 4. This unit rents for $125 for 3 hours. Book all three midway games and get them for $300. This game is perfect for School carnivals, graduation parties. Birthdays, or just some good old fashioned back yard fun.